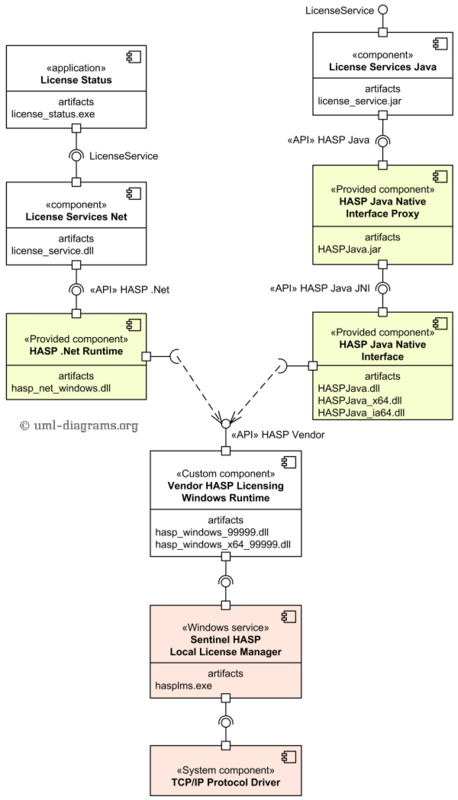 UML component diagram example shows provided and implemented components utilizing SafeNet Sentinel HASP Software Licensing Security Solution and Licensing API. An example of UML component diagram with some simplified view of provided and implemented components utilizing SafeNet Sentinel HASP Software Licensing Security Solution and Licensing API. On the top of the diagram we have some software implemented using Sentinel HASP - License Status .Net application and License Services Java component. License Status application is intended to show license status and is manifested (implemented) by license_status.exe artifact. License Services Java component implements License Service interface and could be used by other Java applications or services. License Status application uses License Services Net component through the License Service interface implemented by this component. The License Services Net component uses HASP .Net API provided by HASP .Net Runtime component which is part of Sentinel HASP product. License Services Java component uses HASP Java Native Interface Proxy to communicate with HASP Java Native Interface component, both components provided by Sentinel. When product is used in Microsoft Windows, the HASP Java Native Interface could be manifested by either HASPJava.dll (32 bit OS), HASPJava_x64.dll, or HASPJava_ia64.dll (64 bit OS). description of all API return codes. Sentinel LDK installation includes API samples for various programming languages including C, C#, Java. For example, HASP Java API includes 4 Java classes: Hasp, HaspApiVersion, HaspTime, and HaspStatus in Aladdin package. Those classes are bundled into HASPJava.jar artifact. The HASP Java API classes load and link native methods from a platform-specific native library using the System.loadLibrary() method. As we said, for Microsoft Windows the DLL library loaded is one of the HASPJava.dll, HASPJava_x64.dll, or HASPJava_ia64.dll. An example of component diagram for a product using Sentinel HASP Software Licensing Security Solution. is a 64 bit DLL API library associated with the software vendor key 99999. When Sentinel HASP Runtime is installed in Microsoft Windows, it also installs Sentinel HASP Local License Manager manifested as hasplms.exe and running as a local Service. This service has dependency on TCP/IP Protocol Driver system component. Noticed a spelling error? Select the text using the mouse and press Ctrl + Enter. This document describes UML 2.5 and is based on OMG™ Unified Modeling Language™ (OMG UML®) 2.5 specification [UML 2.5 FTF - Beta 1]. All UML diagrams were created in Microsoft Visio 2007-2016 using UML 2.2 stencils. You can send your comments and suggestions to webmaster at webmaster@uml-diagrams.org. Copyright © 2009-2018 uml-diagrams.org. All rights reserved.